As a Catholic primary school, St Rita’s is welcoming to all who seek to share in what our school community has to offer. St Rita’s strives to provide an engaging learning environment that allows all children to achieve their personal best. We don’t simply teach curriculum, rather we aim to develop our young students as life-long learners who are empowered to learn and who are keen to contribute to the 21st century society we live in. The importance of a holistic education is highlighted in all aspects of teaching and learning at St Rita’s. The development of the mind, body and spirit is recognised as being central to the growth of the individual child. A well-rounded curriculum, which develops the cognitive, physical, social, emotional, creative and spiritual domains, taught in small classes ensures that the most engaging, enriched learning experiences are planned for your child. Watch our video and discover for yourself what makes St Rita’s the best choice for your child. Cairns Catholic Education has acknowledged the difficult economic conditions that the Babinda area is experiencing and has significantly reduced fees at St Rita’s School, in support of the Babinda community. 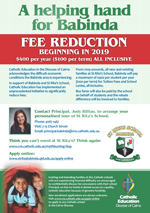 From 2019 all new and existing families at St Rita’s School will pay a maximum of $400 per student per year ($100 per term) for Tuition Fees and School Levies, all-inclusive. Annie Wonga Scholarships are available for indigenous students who apply for enrolment at St Rita’s.